Copenhagen Zoo made international headlines and condemnation after they killed and made a public autopsy of an 18 month healthy giraffe in February 2014. The giraffe was euthanized (shot in the head) because it had undesirable traits ("too common traits") for breeding (Guardian). In other words, the giraffe did not contribute to the diversity of the giraffe gene pool (CNN). The park’s visitors, including children, were invited to watch the autopsy and the zoo lions being fed with the remains. Zoos are part of an increasingly controversial debate. On one hand, zoos provide science education to visitors and create awe-inspiring entertainment ("ooooo isn't that bear funny") for visitors. On the other hand, is it ethically right to lock up animals in "tiny cells" thousands of miles from their natural habitat? This post does not dive into the ethics of the zoo debate but rather looks at how the Copenhagen Zoo decided on function (the brain) over emotion (the heart) when its youthful giraffe, Marius was killed. Copenhagen Zoo states its mission: to act as a “recreational, informative and scientific institution, increasing the interest and understanding of nature and its diversity through experiences based on a relevant, activating and entertaining communication” (Copenhagen Zoo). The breeding program, public autopsy and feeding of the lions with the remains of the giraffe seem to be aligned with activating education/ science part of the Zoo’s mission. In addition, the Copenhagen Zoo, which is part of the European Association of Zoos and Aquaria (EAZA) received support from the organization for the killing of Marius. On one hand, the the killing of the giraffe Marius has be accepted as a legitimate behaviour by the scientists because of the breeding program, there was an intense international outcry. There are several reasons why this resistance was so strong (27,000 people signed a "save Marius" petition).First, the Copenhagen Zoo had given it personality characteristics to the giraffe by naming it Marius. If you think about it, we know the names of our friends and our pets- which drives an instant connection with "the named one". Second, Marius was still a baby. Giraffes in the wild live around 25 years, and in captivity even longer .) Marius' life was cut dramatically short. Third, Marius' life ended via gun-shot to the skull. That's not exactly a dignified death. 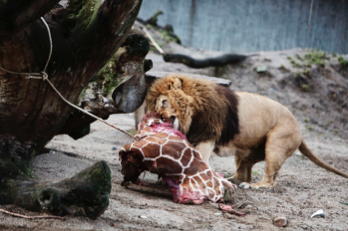 It wouldn't be pleasant for a Marius fan to see lions chowing down either. Forth, the Copenhagen Zoo did not do a great job of sharing its "science" side of the story- that diversity of the gene pool is required to avoid in-breeding diseases. Finally, the zoo did not do a great job of explaining why alternative options like relocating Marius wouldn't work, especially when social media ignited in outrage. In the end, Copenhagen Zoo sided on the part of science and far from the emotional, warm feelings that some zoo visitor have towards animals. And, in doing so, the Copenhagen Zoo has made strong statement about how it views its business and its brand mission.